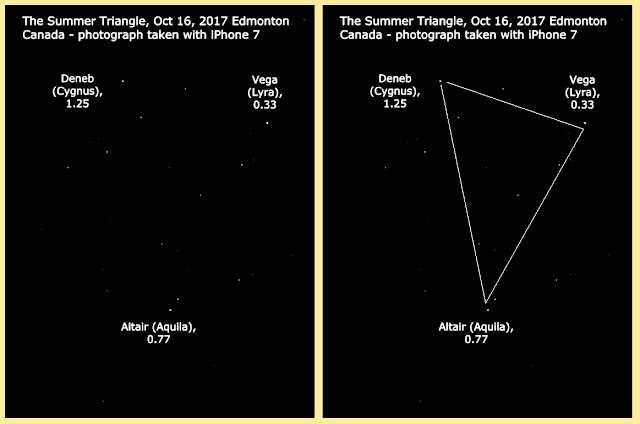 I took a few photos of the well-known asterism, The Summer Triangle, on a recent very clear October evening, with my iPhone 7 camera. The early fall can be a great time for very clear skies around my area, even in a fairly large light polluted city. I should note that the iPhone takes a remarkably good “point and forget” astrophotography, but you generally do have to push it a bit in an image program, like Gimp or Photoshop (or the Apple app provided). The brightness and contrast filters are the main ones to use, though some of the other enhancements can be useful too. Here’s the result, with a little labelling and photo enhancement in GIMP. I also drew in the imaginary lines, that connect the points of the triangle. Below, I have included a picture from Stellarium (the astronomy program) for comparison. Obviously, the Stellarium image is designed to be easy to make out the key features of the asterism – the iPhone image actually picked up a fair number of the brighter stars. That’s easier to see in the larger iPhone images, at the beginning of the blog. And here’s a long exposure, from Sky and Telescope. 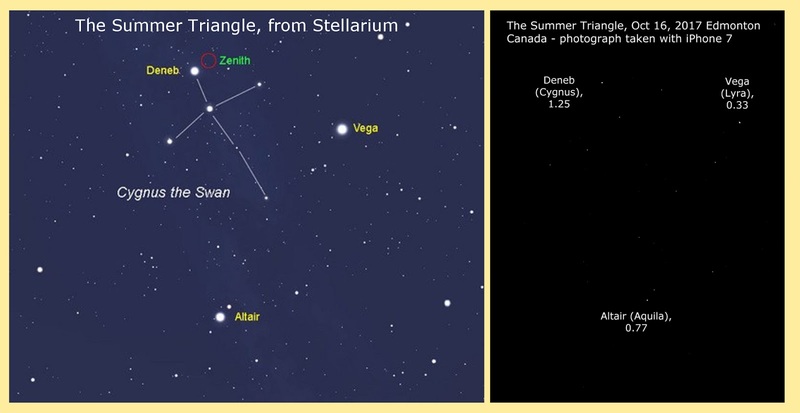 The actual appearance of the Summer Triangle will vary with the time of year, latitude and so forth. Here’s an inverted image (black and white interchanged). Sometimes those can be easier to make out. In some later blogs, I will key in on the constellations that are part of the Summer Triangle, namely Cygnus, Lyra and Aquilla. · It is one of the easiest asterisms to locate and recognize, on par with the Big Dipper. · Whereas the Big Dipper is in the northern sky (circumpolar for many locations), the Summer Triangle is in the southern sky. As the name suggests, it is prominent in the later evening in the summer, from northern hemisphere locations. 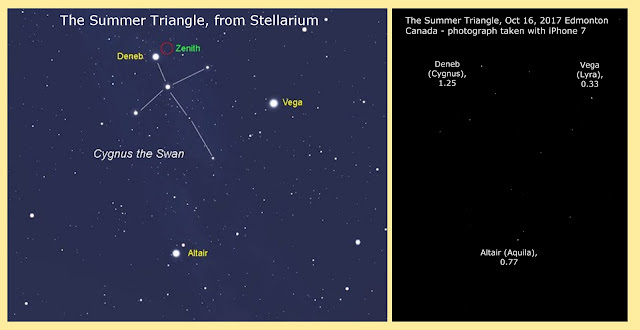 · The three bright stars that make up the Summer Triangle are Vega, Deneb and Altair. All are at least magnitude 1, so they are easily visible even in a light polluted city sky. · Vega is the brightest of the three, at magnitude 0.03. It is the brightest star of the constellation Lyra. o Vega was actually meant to be exactly magnitude 0, when the magnitude scale was scientifically established, though it turned out to be off by a bit. Vega is quite big (A0 star) and close (25 light years), so it is very bright and easy to recognize. o Through even a small telescope, it is quite a beautiful object, shining a pure white, a veritable diamond in the sky. o It has been extensively studied, due to its nearness and brightness. It is baseline star for the various luminosity scales. Its nearness means that it has also had its distance measured very accurately, by parallax. o It’s a variable star, but only varies a bit in brightness. o It’s about twice the radius of the sun, so it won’t last as long as our sun (bigger stars burn out faster). o About 12,000 years in the past, it was the pole star, like Polaris is now. About 13,000 years from now, it will be so again. The pole star changes over time, due to the precession (wobble) of the Earth’s axis. o There is a debris disc around the star, though it is not clear whether there are actually any planets. o It has been featured in a lot of stories and legends over the years. In “modern mythology”, it is notable for being the source of the alien transmissions in Carl Sagan’s novel “Contact”, as well as in the movie based on that book. Both of those are highly recommended. They also feature dodecahedrons and you can’t beat that. · Altair is next brightest, at 0.77 magnitude (though it can appear dimmer, due to being closer to the horizon, which causes extinction of light, due to the light having to travel through a longer atmospheric path). It is the brightest star in the constellation Aquilla. o Altair is another A class star, about 1.8 times the mass of our sun. o It rotates very rapidly (about 9 hours vs 25 days for our sun), so is is quite oblate (flattened). o Its surface has actually been imaged, one of the few stars other than the sun for which that has been accomplished. o It is also quite close to us, at about 16 light years. o Altarian planets are frequently mentioned in Star Trek. But, for my money, the greatest story that features Altair is “Forbidden Planet”, a late 1950’s SF classic, that anyone who is interested in Science Fiction really should see. o As of this time, however, no actual planets have been detected around Altair. 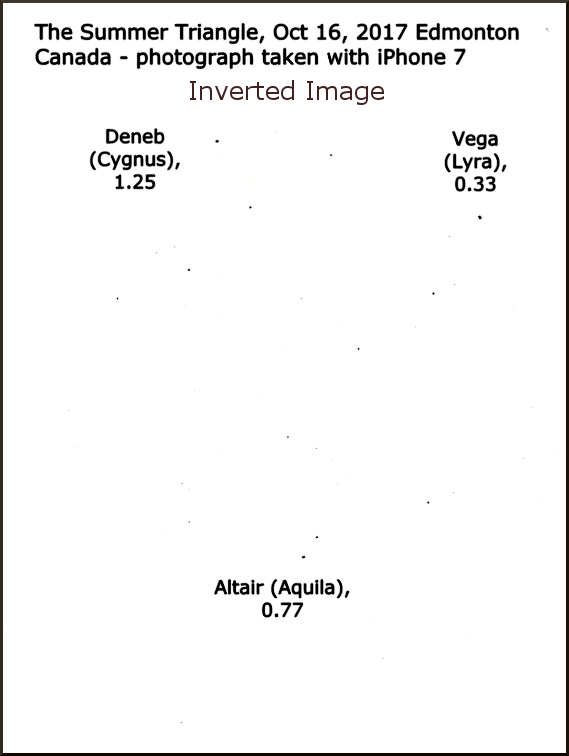 · Deneb is the least bright (though still very bright) at magnitude 1.25. It is the brightest star in the constellation Cygnus, and is part of the asterism the Northern Cross. o It is a blue-white supergiant, with about 19 times the mass of the sun. o It is quite distant, at about 2600 light years, but it’s great size means that it is still bright in our sky (it’s intrinsic luminosity is about 200000 times that of our sun). o It will be the pole star in about 10000 years. o It will probably go supernova in some millions of years. But, since it is so far away, that won’t be a problem for the Earth. o There have been no planets discovered circling Deneb. Given its size, it is extremely unlikely that life could evolve in that system, as the star’s lifetime would be too short for that. o It’s been featured a lot in fiction, especially in Star Trek (Encounter at Far Point, among others). Humphrey Bogart also refers to it, in the Treasure of the Sierra Madres. Also, it is featured in the pilot of Blake’s Seven, a fascinating British SF series of the late 70’/early 80’s. True, but nearly everyone has a cell phone that they usually carry with them, so it is interesting to see what you can get from a device that is simple to use, and always at hand. 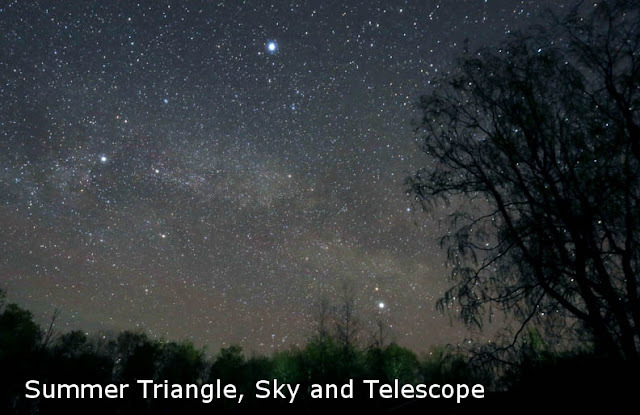 I think of it as an encouragement for non-star gazers to look at the sky. By the way, Philip, I looked at your site and you do some very nice astro-photography.